This extensive eight-volume work was first published between 1867 and 1877 by the linguist John Dowson (1820-81) from the manuscripts of the colonial administrator and scholar Sir Henry Miers Elliot (1808-53). 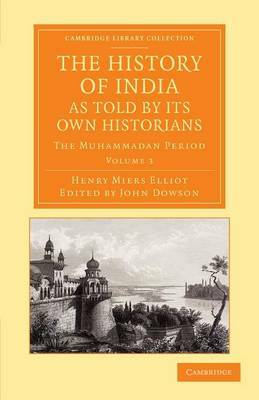 Before his death, hoping to bolster British colonial ideology, Elliot had intended to evaluate scores of Arabic and Persian historians of India, believing that his translations would demonstrate the violence of the Muslim rulers and 'make our native subjects more sensible of the immense advantages accruing to them under the mildness and the equity of our rule'. Volume 3 covers the period from the death of Nasir-ud-din Mahmud (1246-66) to the rise to power of Timur (1336-1405) at the end of the fourteenth century. It includes Timur's purported autobiography and the fifteenth-century Zafarnama of Sharafuddin Ali Yazdi, a history of the Timurid dynasty. The appendices contain studies of contemporaneous texts, including poetry and the Travels of Ibn Battuta. Sorry but this item is out of stock, please check back again soon.